The only thing that’s preventing the Secretary of State from altering his regulations and data matching standards to ensure eligible voters can register to vote is the Secretary of State. That was the conclusion reached in a legal opinion issued late Tuesday by the Legislative Counsel of California. The opinion states there is nothing in federal or state law requiring the Secretary of State to adopt the regulations and data matching standards he’s been relying on that have combined to prevent tens of thousands of eligible California voters from registering to vote. A copy of the opinion is available here in PDF format. “It's clear the Secretary has the legal authority to take the steps necessary to ensure eligible voters have the ability to register before the June primary, but whether he’s actually willing to put the voters ahead of the Bush Administration remains to be seen,” said Senator Debra Bowen (D-Redondo Beach), the chairwoman of the Senate Elections, Reapportionment & Constitutional Amendments Committee. This article was posted on The Brad Blog. It is reposted with permission. Summit County's memory card (PCMCIA) failures have not gotten any better according to an article in this morning's Akron Beacon Journal. If you recall BradBlog has reported on the Summit County memory card failures in the recent past; most recently on April 4. Now, in what is clearly a show of "No Confidence" in their voting machine vendor ES&S, the county elections director is predicting failure with the system in the May 2 Ohio state primary. Summit County Board of Elections Director Bryan Williams is predicting Election Day failures with the memory cards in the county's new optical scan voting system. "I don't think we can assume anything else,'' Williams said at a meeting Tuesday, where the elections board reviewed the latest list of troubles. This seems to be a complete melt-down of everything provided to the county by ES&S. The Beacon-Journal goes on to report the problems. The Alaska Democratic Party filed suit in Superior Court today seeking to force the Division of Elections to release public records needed to verify the 2004 election results. "We are asking the court to release these public records so that the people of Alaska can be assured that their votes were counted correctly," said Alaska Democratic Party Chair Jake Metcalfe (pictured at right). "The Division of Elections' numbers do not add up. The Division has refused to release the public records that would allow us to verify the results. All we ask is that the Lt. Governor and the Director of Elections follow the law and meet their obligation to Alaskans so every one knows why these numbers don't add up." The Alaska Democratic Party has been trying since last year to get the public records of the election in order to find out why there are numerous errors and discrepancies in the state’s reported results of the 2004 general election. The Division of Elections’ latest excuse for refusing to release the election information is that it would create “security risks." "Nothing we have asked for compromises security," Metcalfe said. ""Why is the Division of Elections is so reluctant to provide these public records? What are they trying to hide?" On April 11th and 12th David Drury, Chief, Florida Bureau of Voting Systems Certification (“BVSC”), Richard Harvey, also from the BVSC, and Paul Lux, Assistant Supervisor of Elections from Okaloosa County, Florida, came to Pinellas County, Florida, to make history by conducting the first ever audit of an election in Florida, and the first audit in the nation of an election using Sequoia Voting Systems equipment. The March 7, 2006 election was a very small election involving only three municipalities, but the tabulation failed, rejecting memory cartridges as “already read,” when in fact they had not been read, and they were unable to restart the tabulation for about two hours. During multiple attempts to restart the tabulation, lines of code were sent via e-mail from Sequoia Voting Systems in an attempt to restart the count. Additionally, one candidate was unable to vote for himself, as reported by the St. Petersburg Times, and another was concerned that early votes in his favor made by family and friends were not reflected in the final vote tallies. The election was certified on March 10th. This article was posted at TrueVoteMD.org. It is reposted here with permission. The legislature failed to pass a Voter-Verified Paper Ballot Audit Trail (VVPBAT) bill again this year. As the session began, in January, many of us were optimistic that 2006 was the year for VVPBAT. Prior to the beginning of the session, in late 2005, TrueVoteMD had organized a massive door-to-door campaign in the district of Delegate Sheila Hixson, the Chair of the House committee that deals with election issues. Early in 2006 Delegate Hixson became a sponsor of a VVPBAT bill that TrueVote considered to be model legislation for dealing with this issue. The model legislation was introduced at the beginning of the session in identical bills, House Bill 244 and Senate Bill 713. The House bill moved rapidly. A subcommittee hearing lasted four hours, during which numerous advocacy groups testified in support of the bill including several representing handicapped citizens. The only opposition that appeared during the hearing was from the State Board of Elections (SBE) and several local boards of elections. A principal opponent of the VVPBAT legislation, as she has been since she first made the decision to purchase paperless voting machines for the State, in 2001, was Linda Lamone, the State Administrator of Elections. At one point, Ms. Lamone was asked about the so-called Hursti hack, an incident that occurred in Florida in December 2005, in which Harry Hursti, a computer security specialist demonstrated the ease with which Diebold memory card-controlled equipment could be made to miscount election results. Ms. Lamone stated that she had not received any information from Diebold regarding this incident. Yet TrueVote has a copy of a letter from Diebold to Ms. Lamone dated four days prior to the hearing stating that the company had given several updates to her and her staff. On February 15th, Governor Ehrlich released a letter to the SBE, expressing concern about paperless voting machines. An exchange of letters between the Governor and the SBE dealt with the Hursti hack and the perceived need for retesting the Diebold machines owned by the state. These are published on the TrueVote site. An amendment to HB244 from Delegate Liz Bobo of Howard County, provided for precinct-based optical-scan counting of the 2006 election. The amendment was offered by Chair Hixson and was adopted. The amended bill, reported by the Ways and Means Committee, passed the House of Delegates by a vote of 137-0 on March 7, 2006, five weeks before the end of the 2006 session. It was hailed by VVPBAT supporters for its detailed language and high standards for both security and transparency. The House-adopted bill was immediately referred to the Senate Education, Health and Environmental Affairs (ESE) committee, chaired by Senator Paula Hollinger. Prior to holding a hearing on HB 244, Senator Hollinger invited Diebold to demonstrate its newest paperless voting machine, the TSx. No other vendors were invited to the demonstration. During the session, Diebold was hardly a silent voice in Annapolis. They hired a former staffer for Senate President Miller as a lobbyist, and a former Mikulski staff person to be their P.R. person. The Elections Administrator has been in Annapolis for many years and is said to have close ties to Senate President Mike Miller. This trio spread rumors around the state about the alleged inaccuracy of optical scanners. This article appeared in The Brad Blog. It is reposted with permission. The BRAD BLOG has received a copy of the "Complaint For Declaratory and Injunctive Relief", as filed earlier this week in Allegheny County, PA, by several disabled voters. The complete suit is now available here [WORD format]. The complaint asserts that the state certified Electronic Voting Machines made by Elections Systems & Software, Inc. (ES&S) are not accessible by voters with disabilities -- contrary to the requirements of the Help America Vote Act (HAVA) of 2002 and the Americans With Disabilities Act (ADA). Nonetheless, Allegheny County has selected their machines for use in upcoming elections. That, after previously hoping to go with Diebold, and then with Sequoia Voting Systems, until finally settling on ES&S after the first two choices fell apart either due to the politics of the companies involved and/or due to the discovery their Electronic Voting Systems were found to be hackable. Candidates from both major political parties are planning challenges to last month's primary elections in Illinois. Concerns about the accuracy of election results were raised already on election night and have grown since then. Cook County Republican leaders want 20 percent of the votes from the March primary recounted, because they fear problems with new voting equipment and untrained election judges may have tainted the results. Meanwhile attorney and Democratic candidate Frank Avila is threatening to file a federal lawsuit on behalf of Democrats and Republicans. The Chicago Tribune wrote that Fueled by concerns about "poor management and organizational incompetence," Maureen Murphy, vice chair of the county GOP and a member of the county Board of Review, said she has met with about 200 suburban election judges who detailed a litany of problems from the March 21 primary. Among the issues, she said, were a touch-screen voting machine that "blew up like an M80" and had to be unplugged; machines showing votes that hadn't been cast; and machines not working at all. In one meeting she asked about 125 judges how many of them were confident that every vote at their polling place had been counted, and no hands went up, she said. Nevertheless election officials, as usual, assured candidates and voters alike that somehow the votes were counted accurately. Chicago Elections Board chairman Langdon Neal says a mandated 5 percent recount has already certified the count was accurate, saying problems with voting machines and elections judges who weren't able to handle the equipment, affected the speed of the vote counting, but not the accuracy. According an article in the Indianapolis Star, Indiana Secretary of State Todd Rokita (pictured at right) is investigating possible law violations by Election Systems and Software (ES&S) and MicroVote. A series of alarming reports of irregularities in the Indiana press and reports of the sale of uncertified voting systems, have focused national attention on primaries scheduled for Indiana next month. Rokita said his office, which administers elections across the state, would bring an “enforcement action” to determined whether Election Systems and Software, a Nebraska voting system company, should be fined. According to the Indianapolis Star article, a separate investigation has targeted another election systems vendor, Indiana-based MicroVote General Corporation. The article quoted Rokita, “The secretary of state's office has learned that MicroVote may have sold, or attempted to sell, Indiana county voting machines whose Indiana certifications have lapsed”. Associated Press is reporting that a group of Allegheny County residents along with national nonprofit organization People for the American Way, have filed suit today in federal court in Pittsburgh against county, state and federal officials. The lawsuit filed today says that decision risks chaos on Election Day because of the lack of time to train election officials and educate voters about the change from lever machines which have been in use for 40 years. The suit, Celeste Taylor v. Dan Onorato asks the court to prevent use of machines manufactured by Election Systems & Software until the County has spent the time necessary to identify voting systems that are secure; reliable; and accessible to voters with disabilities. Complaining that the federal Department of Justice has pressured Allegheny to buy ES&S iVotronic or be forced to return $11.9 million in federal funding, the group is seeking an injunction to require the county to continue using lever machines instead of using touch-screen machines the county agreed to purchase last week from Election Systems & Software for $11.9 million. The machines were the county's second choice after machines manufactured by Sequoia Voting Systems failed to pass state certification tests. The defendants in the case are the Pennsylvania Secretary of State; Dan Onorato, Allegheny County Chief Executive; James Flynn, County Manager; and senior officials at the federal Department of Justice. Maryland voters will vote on paperless touchscreen voting machines again this year thanks to concerted efforts by Democratic State Senate President Mike Miller and Senator Paula Hollinger, chair of the committee on Education, Health, and Environmental Affairs. In a disappointment to election integrity activists nationwide, the Senate killed a bill that had passed unanimously in the Maryland House of Delegates that would have called for voter verified paper records and mandatory audits on thde last day of the legislative session. As sent to the Senate, the bill also included an amendment that called for implementing a paper ballot optical scan voting system for this year's elections. In addition to the unanimous support of the House of Delegates, the proposal also had the full support of Governor Robert Ehrlich, Jr. (R). Senator Hollinger is running for the U.S. House seat currently held by Rep. Benjamin Cardin. Senator Hollinger has ensured that it will be impossible to independently verify the results of that election results and that the votes of Maryland citizens will be counted by propreitary software provided by Diebold Election Systems. Friday’s joint hearings conducted by the Chicago City Council’s Committees on Finance, Budget and Government Operations and Committee on Committees, Rules and Ethics failed to shed much light on the “events and problems that occurred during vote tabulation for the City of Chicago Primary Election held on March 21, 2006,” as stated in the meeting’s agenda. Alderman Ed Burke (14th) led off the hearing with a statement expressing concerns and then proceeded with two hours of sharp questioning of Jack Blaine, president of Sequoia Voting Systems, Inc., the company that supplied the voting systems used in both the City of Chicago and suburban Cook County. Occasionally joined by Alderman Richard Mell (33rd) and Alderman William Beavers (7th), Burke, chairman of the Council’s Finance Committee presented a timeline chart relating to the acquisition of Sequoia by Bocca Raton, Florida-based Smartmatic Corporation in March 2005. Throughout, Blaine professed to have little knowledge of Smartmatic’s Board of Directors or principal investors or stockholders, even though he serves as president of Smartmatic as well as Sequoia. Blaine even professed ignorance of the price Smartmatic paid to acquire an 85% interest in Sequoia from De La Rue Cash Systems 13 months ago, stating only that it “was less than $20 million.” Of course, it was widely reported in the financial press at the time that the purchase price was $17.6 million, but apparently Blaine doesn’t pay much attention to details like major acquisitions his company might have made. At issue was a disclosure affidavit which Sequoia had completed on August 3, 2005, as a part of the procurement process. The form, which requires the disclosure of officers and directors of the corporation and anyone having a more than 7-1/2 percent interest in the company is silent as to Smartmatic’s majority interest in Sequoia. The affidavit, signed by then Sequoia president, Tracy Graham, lists only herself as president and “J. Blaine” as secretary. Blaine consistently deflected questions about the contract between Sequoia and the Chicago Board of Election Commissioners, suggesting that Howard Cramer, vice president of sales, was responsible. At one point Blaine appeared to disassociate himself from the contract (actually a number of separate agreements) by indicating that Cramer might have been the signatory. However, some of the documents, signed only eight months ago, which Blaine claims he did not know about or did not remember, bear what purports to be his signature, but do not disclose his title as required. THE GOOD NEWS: A Local TV News Outlet That Reports Actual News! This article was published on The Brad Blog and is reposted with permission. Proving that local TV News stations actually can serve their viewers by actually investigating stuff that matters, and then reporting on it, Indianapolis' WISH-TV 8 does it again. In yet another report on local election problems, WISH-TV has been keeping their viewers informed with a series of stories on voting issues. "Well, once again, a Voting Machine Company is breaking Indiana law and violating county contracts," the story by reporter Pam Elliot began. 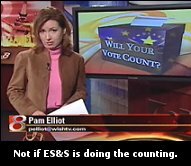 Last night, WISH TV 8 reported on the failure of Elections Systems & Software (ES&S) to perform up to their contract with their customers. That contract: to provide ballots to voters and touch-screen voting equipment that actually works. Johnson County Indiana was supposed to have their ES&S iVotronic DRE (touch-screen) machines set-up and in use for "absentee voting". However, contrary to their contract and, as WISH TV reports, in violation of state law, ES&S has failed to program the counties "smart cards" with ballot definitions. Which means the voting machines are of no use. Also missing are printed paper ballots for Johnson County and nearly two-dozen other counties across the state. Which means that in order for these counties to conduct "absentee voting" they will have to copy paper ballots and provide those to the voters. VerifiedVoting.org has launched an action alert in support of Maryland House Bill 244 as passed unanimously by the Maryland House of Delegates. VoteTrustUSA wholeheartedly supports this citizen action and encourages all Maryland residents to sned a message to the Maryland Senate. Your help got H.B. 244, Delegate Hixson's voter-verified paper record bill, passed unanimously in the House. The Senate version has been gutted, though, and your support is needed one more time -- without your effort, Maryland may not get verifiable voting this year. The original version of the bills, H.B. 244 and S.B. 713, contained many good provisions, including a robust random manual audit requirement which will help ensure that voting systems are working as they should. H.B. 244 was amended to include a requirement that all Maryland elections this year will be conducted using paper optical scan ballots (with accessible ballot-marking devices). Insist that the Senate pass the House version of the bill. VerifiedVoting.org joins TrueVoteMD.org in asking you to contact your Senators today -- ask them to dump the bad version of the bill, and pass the language in H.B.244 as it passed the House. The Governor is ready to sign and fund it. Even if you wrote before, you can send another email or fax in less than 60 seconds. It can make all the difference. It takes less than a minute to send a free fax or email to your senator from the VerifiedVoting.org Action Center. ACTION ALERT!! All U.S. Citizens: Demand Fair Elections in Florida! Texas Primary Recount Halted By Secretary of State!